« CrystEngComm publishes its 10,000th article! Congratulations to the CrystEngComm award winners at the 26th Symposium on Organic Crystals! This month saw the occasion of the 26th Symposium on Organic Crystals, organised by the The Chemical Society of Japan Division of Organic Crystals and held from 3rd – 5th of November at Yamagata University in Yonezawa, Japan. 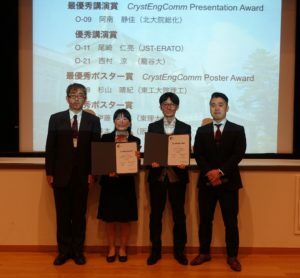 The conference was chaired by Professor Hiroshi Katagiri of Yamagata University, and CrystEngComm was on-hand to award prizes to the best oral and poster presentations by young researchers. The CrystEngComm award for Outstanding Presentation went to Shizuka Anan, of Hokkaido University, for her presentation entitled ‘Stochastic polymerization of monomers fixed in a MOF crystal as its organic ligands’. The CrystEngComm award for Outstanding Poster went to Haruki Sugiyama, of Tokyo Institute of Technology, for his poster entitle ‘A metal complex with shows photochromism, thermochromism, and mechanochromism – structure-property relationships study’. CrystEngComm award winners Shizuka Anan (center left) and Haruki Sugiyama (center right) being presented their awards by division chair, Professor Kazuki Sada of Hokkaido University (left), and RSC representative Hiromitsu Urakami (right). CrystEngComm offers a hearty congratulations to both prize winners!